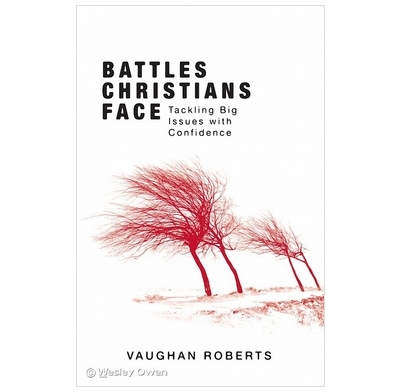 Vaughan Roberts equips Christians with practical weapons to face our daily battles with confidence. - How can I approach feelings of lust in a godly way when 'lust' is now an alluring name for perfume or chocolate? - How can I battle guilt with integrity when friends encourage me to believe that sin doesn't really exist? - Why do I feel so depressed when the impression is often given that Christians should always have a smile on their face and in their heart? In Battles Christians Face bestselling author Vaughan Roberts equips us with practical weapons to face our daily battles with confidence. The teaching of this book restores our hope of living godly lives here and now - lives that honour and bear witness to Jesus Christ. Excellent read which has Scriptural points of reference. Informative and practical. It really touches on battles Christians face especially Keeping Spiritually Afresh and Image. Got to understand how image and doubt are really challenges and sins at the same time. Vaughan Roberts outlines eight areas where Christians may face struggles with themselves,dispersing the idea that the Christian life is somehow a retreat from reality with all its problems.In every case the teaching is realistic and helpful, rooted in the Bible. For me, the emphasis of this book was to "humble the sinner, exalt the Saviour and promote holiness" by looking at a selection of battles christians face - and it achieved that exceedingly well. The book is written in a very easy readable style. It is challenging, thought-provoking, and hopefully life-changing too. This book will now be appearing on our church bookstall! This book takes one chapter on each of the following difficult areas of temptation: image, lust, guilt, doubt, depression, pride and homosexuality. The conclusion deals with staying spiritually fresh. The great strengths of the book are at least twofold: Firstly the book encourages us to fight the fight of living for Jesus. All too often we can be lax, lazy or self deceived and need this encouragement. Secondly, there is a refreshing trust in scripture and winsome presentation of Bible passages that address issues. For the uncertain, confused or struggling believer this is invaluable. The limitations of the book flow from the nature of attempting to cover such wideranging topics - many who struggle with these issues will not find their solution easy, quick or apart from meaningful pastoral counsel and support. many who struggle will already know the answers to their problems - but lack the support and care to live it out. This excellent book then functions best as one part of holistic pastoral care and concern. Like many good books - best read in the context of a godly, loving church family! This book provides a good introduction into different battles Christians can face. The author uses bible examples and gives practical applications on how as Christians we can faces these battles in our lives. I was really impressed with this book. Each chapter tackles a different issue, many of which are rarely written or spoken about. Each chapter begins with a passage of scripture which is referred to throughout the chapter. I found it very readable and challenging as well as encouraging that I am not the only Christian to face these issues. Each chapter stands alone, so the book can be dipped in and out of. I very much recommnend this. This book addresses some common issues with which Christians struggle. It gives clear biblical teaching and is also very practical. It is pretty jargon-free. It also bravely takes a look at homosexuality and seeks to encourage people to help those who are struggling with temptation in this area. A useful book. Hope Roberts writes a Book 2 on other areas with which Christians struggle. Really helpful and honest book. Lays out clearly some and the many and distressing trials that many Christians face, but would find hard to talk about openly. Having discussed these battles, it then provides great comfort and encouragement to persevere in these battles and make progress.